Call us or fill in the form on the right to get a free quote, or read on to learn how we’re Total Water deionized water systems design and service is different than the rest. Not all di water systems are created equal. Total Water’s deionized water system design achieves 18.2 megohms resistivity, while others in the industry reach 10 megohms. It allows us to deliver DI water that meets the most stringent protocols. Total Water also utilizes a deionization or de-mineralizing process that provides complete traceability for validated systems through our specialized regeneration process. Some of our competitors won’t track their resin in an effort to save money. This results in different resins being mixed together, thus lowering the quality of the resin and making traceability impossible. Total Water provides a number of different systems, based on your production needs. Separate bed deionizers can have a higher exchange capacity and less complicated operating procedure than mixed bed systems. In a dual bed deionizer, the cation and anion exchangers are connected in series. The cation tank removes positively charged ions (calcium, sodium, magnesium, iron, manganese and potassium). The anion tank removes negatively charged ions (sulfates, chlorides, carbonates, bicarbonates, nitrates and silica). Strong base anion units typically produce 0.2 megohm water at a pH of 8-9, whereas weak base anion units produce lower water quality, a pH of 6-7, and do not remove silica or CO2. Mixed bed deionizers can have a higher water quality, lower rinse water requirements, and more neutral pH than dual bed systems. In a mixed bed deionizer, cation and anion resins are combined and mixed in a single tank. Thousands of cation and anion ion exchanges take place as water passes through the resin bed. Typical water quality of 16 megohm or more with neutral pH. Three tanks or more are connected in series; or parallel; or a combination of the two. Produces high purity water in any desired quantity. Systems may consist of strong acid cation, strong or weak base anion and mixed bed media tanks in a number of varying combinations, to produce the water quality required. Water qualities of 18 megohm, with a neutral pH, can typically be attained. Exchange service tanks using other water treatment media create a more complete high purity water system. 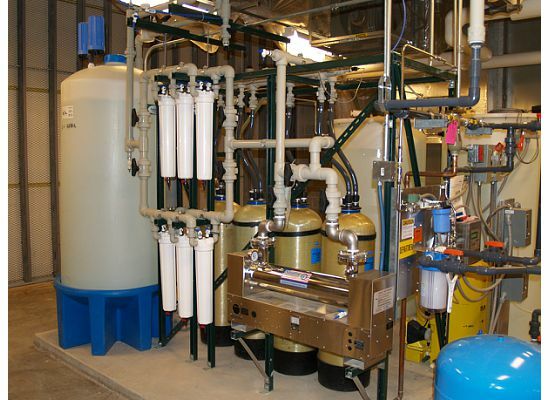 Typically, a system may include one or more of the following processes: softening, depth filtration, carbon adsorption, UV sterilization, submicron filtration, or other treatment equipment. Deionized water is an essential resource in all laboratory environments. We can help you meet your stringent standards. Expertise and service capabilities. 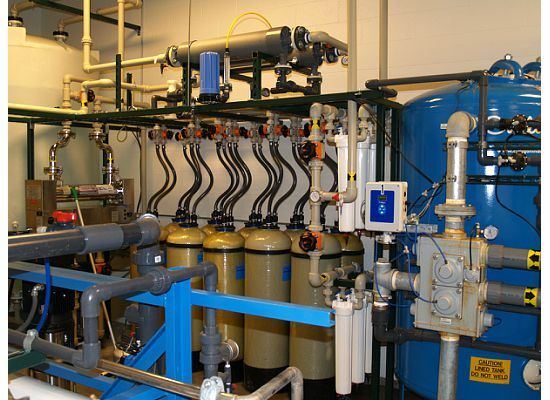 We have a purified water engineer on staff, with the ability to design and troubleshoot high purity water treatment systems. Location. Based in the Midwest, we’re able to reach you quickly in the event there is a problem with your system. Response time. We provide 24 hour emergency service. You probably won’t see a “deionized water for sale” sign at any stripmall. If you need quantities more than a gallon at a time, it will require the installation of a di water system. Total Water is a di water supplier to customers throughout the Midwest, serving the needs of customers in Wisconsin, Illinois, Iowa, Michigan, Indiana and Minnesota. Every industry’s deionized water must adhere to a set of standards established by a number of professional organizations. Total Water has extensive expertise in each of these standards areas, and works closely with governing bodies to ensure you’re in compliance. 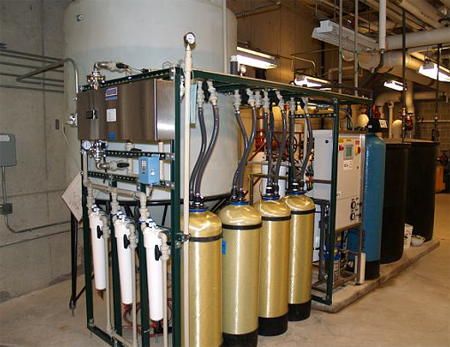 What are the components of a di purified water system? Where can I buy deionized water? You probably won’t see a “deionized water for sale” sign at any strip-mall. If you need quantities more than a gallon at a time, it will require the installation of a di water system. What is the cost of deionized water? Your overall system cost will vary based on the quantity of the DI water and quality(standard that needs to be met). DI water can normally be provided per exchange or on a cents per gallon basis. 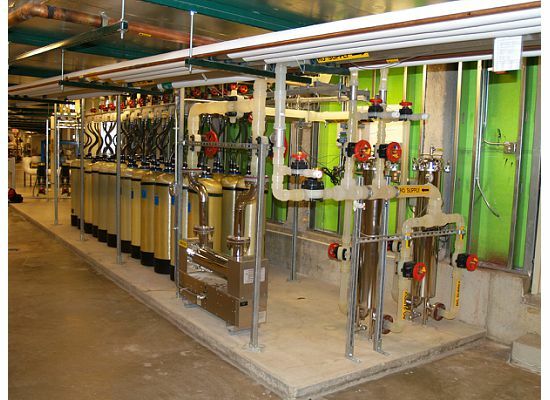 The system cost includes DI canisters and water quality equipment. How is deionization resin used? Deionized water resin is either used as a main treatment component or a polishing component in the water treatment system. As we mentioned earlier, Total Water uses single-tank regeneration, so the resin is always assigned to a specific tank for traceability. This improves the quality of the di water. Some suppliers provide bulk di resin, which eliminates the traceability and lowers the purity. When you have 18 megohoms resistivity, your deionized water ph can only be 7. “pH” is the percent of hydrogen in the water. Does Total Water sell a deionized water filter? Many people think you can buy a di water filter, but that’s not the case. It’s a process, in which one ion is exchanged for another. The process is explained in the next section. How do you make deionized water? Is there a deionized water chemical formula? The chemical formula for deionized water involves the exchange of the charged ions in tap water for hydrogen and hydroxl ions. Water in its purest form is hydrogen (H+) and hydroxl (OH-) ions, which form the water molecule, H2O. Does di water cause corrosion of pipes? Pure Water measured at 18.2 Megohm is normally run through a pipe made of polypropylene or PVDF. There is a misconception that di water cannot be corrosive to stainless steel piping. This is incorrect, stainless steel piping will break down over time when used in high purity water systems. As the stainless steel loses it’s passivation it begins to leach iron into the purified water stream. Get a quote or ask a question about your DI water System! Want to request a quote or have a question about service or system specs? Call 608-220-2883 or fill in the form below. We’ll contact you within 1 business day! How can we help you with your di water system?